Popular droning sites along the San Francisco Peninsula no longer allow the use of any unmanned aircraft systems (UAS) following a park superintendent order. While drones are currently allowed in California State Parks, local district superintendents are allowed to ban them at any of its local sites. Christopher Spohrer, the Santa Cruz District Superintendent joined other regional park districts in May when he signed new restrictions on drone use at its parks. Santa Cruz District's new order is not yet online, but a notice should be posted at all parks and beaches it is being enforced. It includes restrictions on all use of model aircraft, UAS or gliders at any the state parks and beaches in its district, which encompasses the Santa Cruz Mountains as well as the parks along the coast from Watsonville to Half Moon Bay, including Half Moon Bay State Beach, New Brighton State Beach, Pescadero State Beach, Pomponio State Beach and San Gregorio State Beach. The Bay Area District previously restricted model aircraft and UAS in September, which included Candlestick Point State Recreation Area, as well as all parks in the East Bay Regional Park District. Airplane Hill, located south of the four-corner intersection on Panoramic Highway in Mount Tamalpais State Park, is the only exception to the ban at state parks in the Bay Area District. A grassy field in the upper parking lot of Seacliff State Beach was also excluded from the Santa Cruz District. Shoreline Muir Beach Overlook and Fort Funston are also open to drone use when hang gliders and para-gliders are not in the air, according to the National Park Service. Between the Federal Aviation Association (FAA) easing its unmanned aircraft guidelines last year and new drone models being released each year, more drones are in the air than ever. According to a FAA report, sales of consumer drones were expected to spike from 2.6 million drones in 2016 to 7 million in 2020 with some of the highest concentrated users in the Silicon Valley. NO NATIONAL PARKS: Currently, the National Park Service (NPS) prohibits drones at national parks which include the Golden Gate National Recreation Area in San Mateo, San Francisco and Marin counties; Rosie the Riveter grounds in East Bay, Fort Point, Presidio, Alcatraz Island and the Maritime in San Francisco as well as Point Reyes and Muir Woods in North Bay. See all national park trails and parks where drone use is currently prohibited. National Park Service rangers may issue citations of $125 and additional fees to drone users who violate its policies. SOME STATE PARKS: California State Parks allow drone use, with the exception of some regional districts have posted their own local rules. In the Bay Area, the local parks are currently prohibiting drone use at the majority of state parks. View some exceptions above. SOME CITY AND COUNTY PARKS: There are currently no drones allowed at many local parks such as San Mateo County and Santa Clara County parks as well as the majority of city parks in the area. The Santa Clara Valley Open Space Authority, which maintains parks throughout Santa Clara County as well as for the cities of Milpitas, Santa Clara, Campbell, San Jose and Morgan Hill also ban the use of drones unless granted a permit for use. The Port of San Francisco, which maintains Heron's Head Park, also bans all drones as part of its status as a wildlife protection area. Mission Bay Park, maintained by MJM Management Group, says they have added a park rule banning drone use as well. PRIVATE LAND Privately-owned fields, farms, and other spaces may be a good option with permission from the landowner. Santa Clara County Model Aircraft Skypark is a local nonprofit that allows its members to fly drones and aircraft if they follow Academy of Model Aeronautics (AMA) guidelines. REGISTER: Register your UAS online if it weighs more than 0.55 pounds and less than 55 pounds or file a paper request for drones more than 55 pounds. Registration costs $5 and is valid for 3 years. 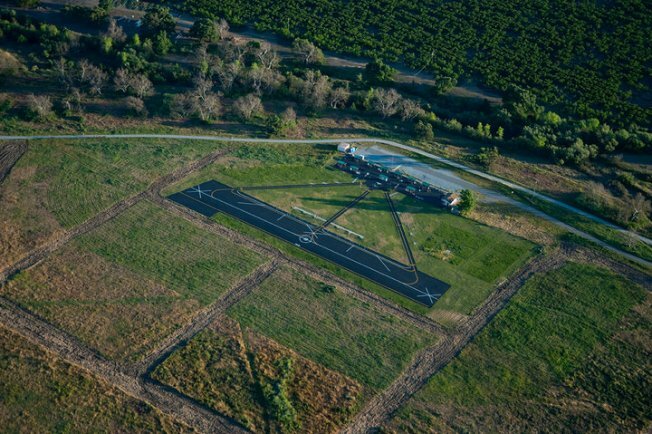 FLY SAFE: Fly at or below 400 feet and keep it in sight. Never fly over groups of people, stadiums, sports events or near emergency response efforts such as fires. The FAA also mandates UAS users never operate under the influence. The FAA outlines several safe flying practices here. RESPECT NO FLY ZONES: Never fly near other aircraft, especially near airports, and be aware of airspace requirements. In the Bay Area, this includes no flying zones surrounding three large airports (SFO, OAK and SJC) and smaller airports. You can download the FAA "Know Before You Fly" application to verify if you’re in a safe fly zone. B4UFLY is available for free download in the App Store for iOS and Google Play store for Android.